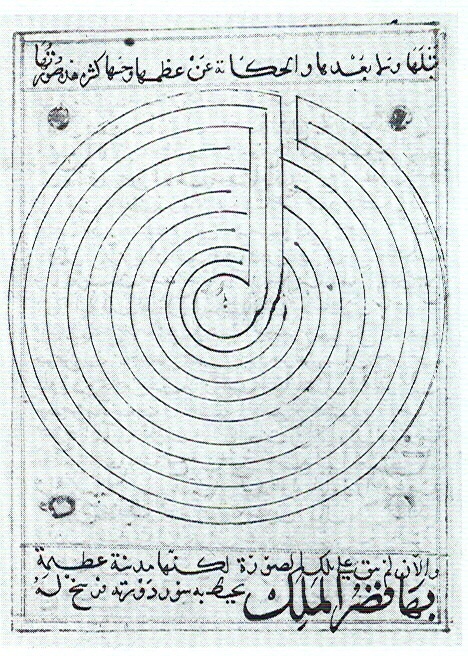 An interesting labyrinth is reproduced in the book of Kern (fig. 200, p. 119)°. A drawing by Arabian geographer Al Qazvini in his cosmography completed in 1276 is meant to show the ground plan of the residence of the ruler of Byzantium, before the large city of Constantinople was built up. This non-alternating labyrinth has 10 circuits and a unique course of the pathway. I will show this using the Ariadne’s Thread and the pattern. In my post “From the Ariadne’s Thread to the Pattern – Method 2” (see related posts, below), I have already described how the pattern can be obtained. When deriving the pattern I always start with a labyrinth that rotates clockwise and lies with the entrance from below. 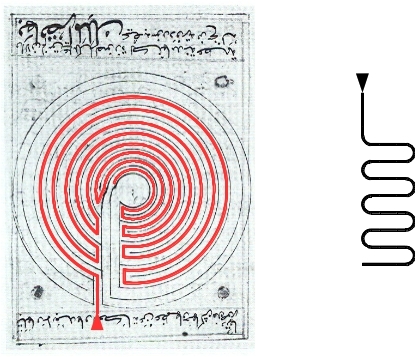 The labyrinth by Qazvini rotates in clockwise direction, however it lies with the entrance from above. 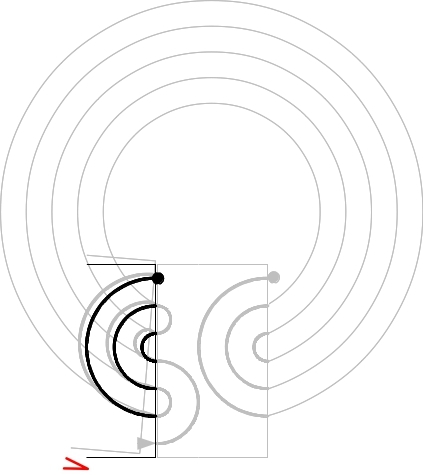 Therefore I rotate the following images of the labyrinth by a semicircle so that the entrance comes to lie from below. So it is possible to follow the course of the pathway with the Ariadne’s Thread and in parallel see how this is represented in the pattern. Four steps can be distinguished in the course of the pathway. The path first leads to the 3rd circuit. The entrance is marked with an arrow pointing inwards. 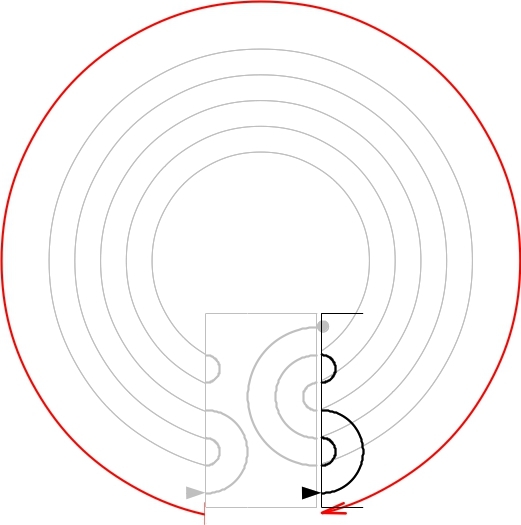 In the pattern, axial sections of the path are represented by vertical, circuits by horizontal lines. The way from the outside in is represented from above to below. 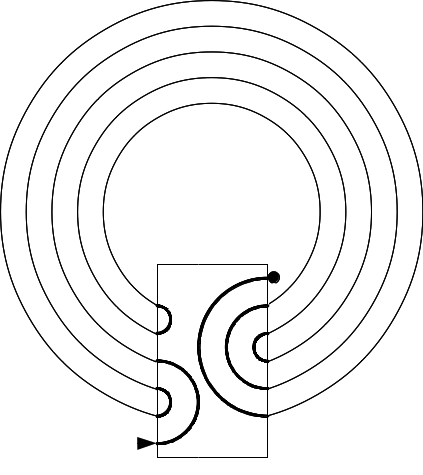 In a second step, the path now winds itself inwards in the shape of a serpentine until it reaches the 10th and innermost circuit. Up to this point the course is alternating. Next follows the section where the pathway leads from the innermost to the outermost circuit whilst it traverses the axis. 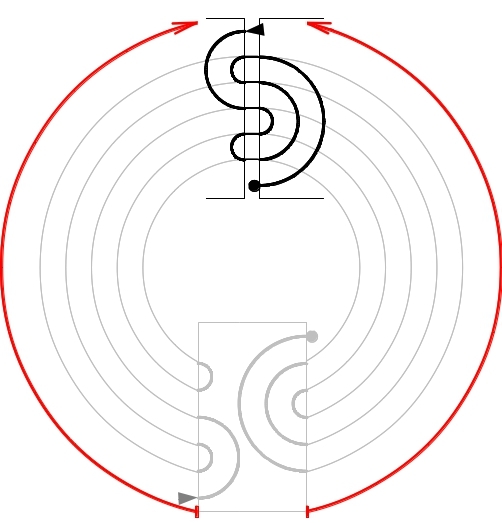 In order to derive the pattern, the labyrinth is split along the axis and then uncurled on both sides. 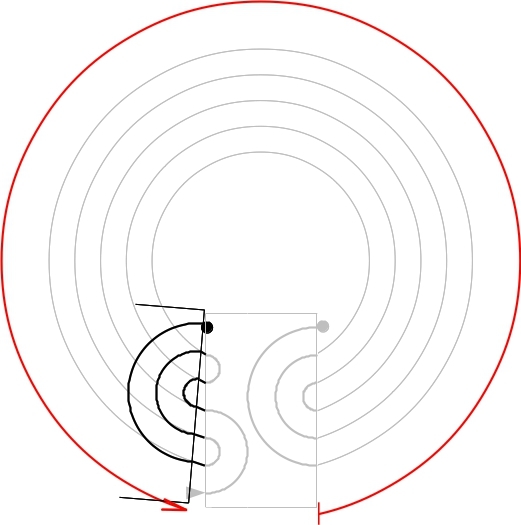 As the pathway traverses the axis, the piece of it along the axis has to be split in two halves (see related posts below: “The Pattern in Non-alternating Labyrinths”). This is indicated with the dashed lines. These show one and the same piece of the pathway. In the pattern, as all other axial pieces, this is represented vertically, however with lines showing up on both sides of the rectangular form and a course similarly on both sides from bottom to top. Finally the pathway continues on the outermost circuit in the same direction it had previously taken on the innermost circuit (anti clockwise), then turns to the second circuit, from where it reaches the center (highlighted with a bullet point). 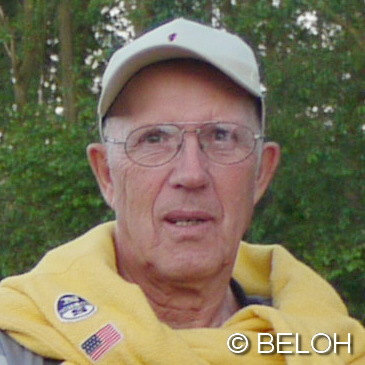 °Kern, Hermann. Through the Labyrinth – Designs and Meanings over 5000 Years. Munich: Prestel, 2000. 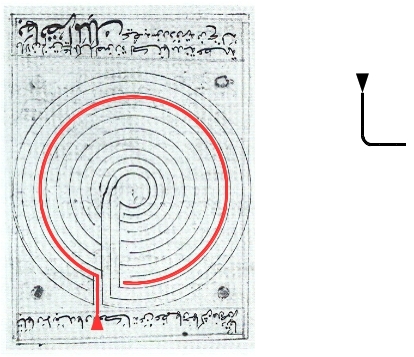 As is the case with the labyrinth itself and the seed pattern, there are also two representations of the rectangular form: this can be represented either with the walls or with the Ariadne’s Thread. In addition, there are two methods to obtain the rectangular form and therefore two versions of it. 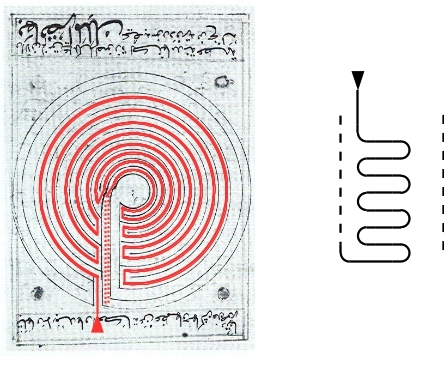 Ill. 1 summarizes this with the example of my demonstration labyrinth. 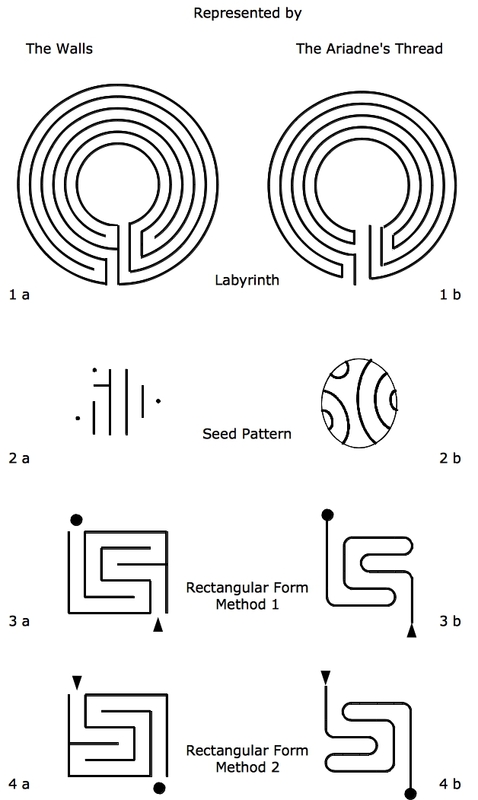 This illustration shows on the first line the labyrinth (figures 1), on the second line the seed pattern (figures 2), on the third line the rectangular form obtained with method 1 (figures 3) and on the bottom line the rectangular form obtained with method 2 (figures 4). Each of these are shown in the representation with the walls (left figures a) and with the Ariadne’s Thread (right figures b). When we speak of a „labyrinth“ we usually mean the labyrinth in its representation with the walls. This is shown in fig. 1 a. But also the representation with the Ariadne’s Thread is in widespread use and generally well known (fig. 1 b). This is usually simply referred to as the Ariadne’s Thread. Fig. 2 a shows the seed pattern for the walls, fig. 2 b the seed pattern for the Ariadne’s Thread. As Erwin and I have written so much about this in recent posts, I don’t elaborate more on it here. If we start from the labyrinth (fig. 1 a) or from the Ariadne’s Thread (fig. 1b) and apply method 1, we will as a result obtain the rectangular forms shown in line 3. Thus, there exists a rectangular form for the walls (fig. 3a) as well as for the Ariadne’s Thread (fig. 3b). If we apply method 2 this results in the rectangular forms of line 4. These are the same as the figures on line 3, although rotated by half the arc of a circle. For what I termed “rectangular form” here, in the literature we can find also the terms „compression diagram“ or „line diagram“ or else. And, most often, we will encounter rectangular forms for the walls obtained with method 1, i.e. figures like fig. 3 a.
I, however, always use the rectangular form for the Ariadne’s Thread. This is the simpler graphical representation. Furthermore, I use the version obtained with method 2, as the result can be read from top left to bottom right, what corresponds better with the way we are used to read. This figure (e.g. fig. 4 b), the rectangular form for the Ariadne’s Thread obtained with method 2, is what I refer to as the pattern. In the last post I have shown a first method of how to transform the Ariadne’s Thread into the rectangular form. For this, one of the halves of the axis was fixed and the other rotated by a full turn along the circuits. This resulted in the pattern with the entrance on bottom right and the center on top left. Here I will show a second method. We start from the same baseline situation as in method 1. 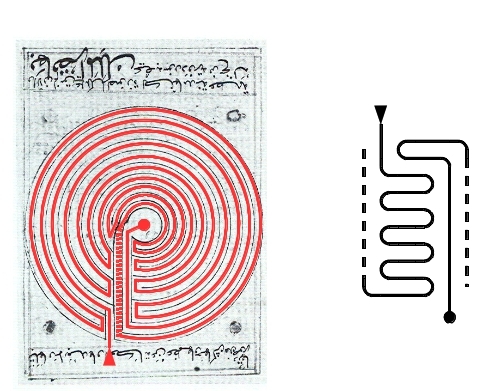 The labyrinth is presented with it’s Ariadne’s Thread with the entrance at the bottom and in clockwise rotation (fig. 1). In method 2, however, each half of the axis is rotated by half a turn along the circuits (fig. 2). Both halves then meet on top of the circuits. Perhaps, this figure shows even better, how by flipping up both ends of the axis the circuits are shortened from full circles to short lines. After straightening-out the result shows the same pattern as in method 1. However it now lies with the entrance on top left and the access to the center on bottom right. In both methods we started from the same labyrinth in the same basic situation. Both methods lead to the same pattern. However, in method 1, the pattern lies with the entrance on bottom right and the center on top left. In method 2 this is rotated by 180 degrees so that the entrance lies on top left and the center on bottom right. This orientation of the pattern corresponds better with the way we are used to read. For that reason, I prefer method 2. In my last post I have shown how the seed pattern can be transformed into the pattern. The same result can be obtained by transforming the Ariadne’s Thread into the rectangular form. Fig. 1 shows the Ariadne’s Thread of my demonstration labyrinth with the seed pattern highlighted. In addition the situation of the entrance (arrow) and of the center (bullet point) is indicated. In fig. 2 we now fix the left half of the axis and rotate the right half anticlockwise a full turn along the circuits. By this, the circuits are continually shortened. Immediately before the right half reaches the left half of the seed pattern on its opposite side, the circuits have reduced to very short lines. But, as can be seen, it is really the circuits of the labyrinth, that connect the ends of both halves of the seed pattern. At the point where both halves meet each other, these remaining pieces of the circuits disappear. In lieu of them the straight of the meander appears. This is composed of the outer vertical lines of the original auxiliary figure of the seed pattern. Therefore, it is absolutely justified to straighten-out the meander at the point where it intersects with the vertical straight. The lines that connect the ends of the seed pattern really represent the circuits of the labyrinth. In fig. 3 we have now generated the meander starting from the Ariadne’s Thread, fixing one half of the seed pattern and rotating the other by a full turn. I refer to this way of generating the pattern as method 1. I had fixed the left half and rotated the right half. Fig. 4 shows that we could also fix the right half and rotate the left. In the result, this makes no difference. The result of this method is in both cases the same meander that is straightened-out to the pattern as described previously. Important: Please notice, that after this transformation, in the pattern the entrance lies on the bottom right and the center on top left. This result is against our spontaneous intuition and also contradicts with how we are used to read. It is a result of the applied method 1. Meanders in Labyrinths – Why Straighten-out? Up to now we have examined the “detour factor” of the Classical and of the Chartres labyrinth. That’s why the Roman Labyrinth as own type in the long history of labyrinth may be considered today. We choose a sort of prototype with 21 m for the side lengths and an axial distance of 1 m.
The direct way from “A” to “Z” straight across all boundary lines to the center amounts to 10.55 m.
The whole, long way from the entrance into the center amounts to 433.50 m if I follow all the twists through the four sectors. This proves a relation between the long and the short distance of 433.50: 10.55 = 41.1. This is a much higher “detour factor” than the value of 24.4 for the Classical labyrinth. However, it corresponds approximately to the Chartres labyrinth with 40.78. If I handle the thread at the beginning and at the end and stretch it apart, I will get a straight line which reaches from “A” to “Z” and which corresponds to the way into the middle, that is 433.50 m.
If I join together the beginning and the end, I will get a circle. The circumference corresponds to the straight line of 433.50 m. The diameter would be 137.99 m.
I can also make a square with the same size from it. 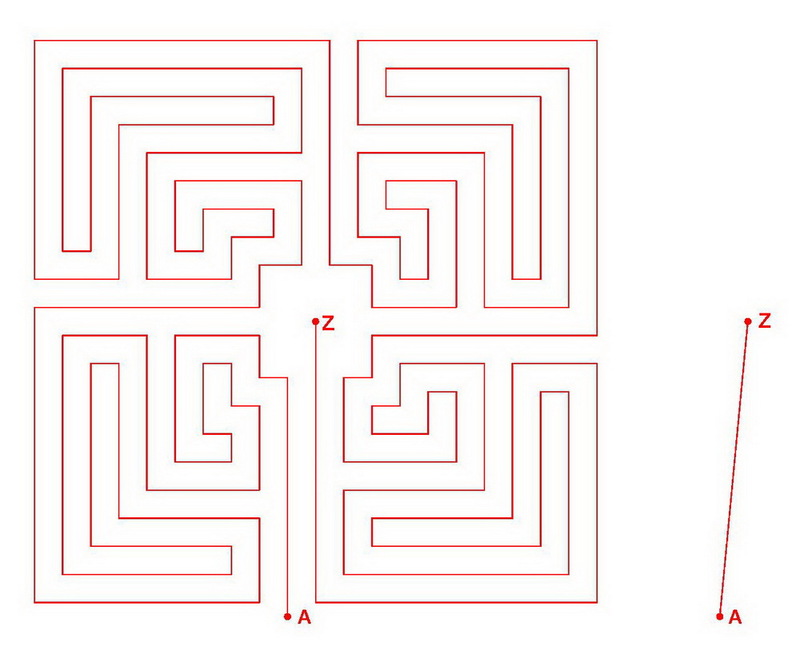 This would have four side lengths of 108.38 m.
Don’t be surprised that the original labyrinth looks so tiny. This is due to the “detour factor” of 41.1.